Looking for stationery, Zakka stuffs and material for scrapbook? 7 Polka Dots will be your best choice. 7 Polka Dots is the biggest ready stock online stationery in Malaysia. Their products are based imported from Korea, Taiwan and China. You can find lots of cute and pretty Korea stationery in their website with reasonable price and good services. Other than that, they are selling in wholesale price too no matter how much quantity you need. All of their products are ready stocks. They do accept wholesale, the minimum order will be Rm500 and above. And the best part is they ship worldwide too. Plain thick quality paper is suitable for doodling, sketching, planning and writing. I use it as my food dairy. The color is very nice when I color on the paper. Best to decorate with it in anything for example like scrapbooking, DIY and even though us it to decorate your wall. They have different colors and designs available. It is a paper sticker with different kind of design and shape in a pack. It is best to use for DIY or decorate dairy, notebook, planner and scrapbook. Any Rilakkuma fans here? 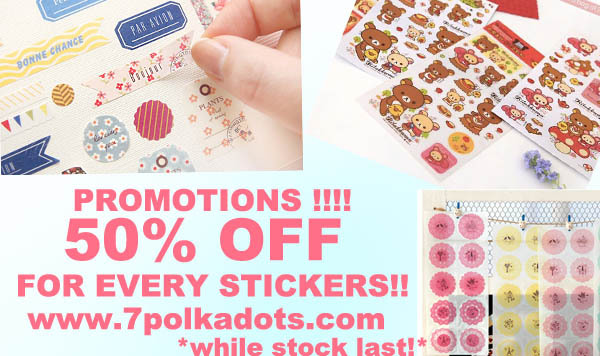 Then you should visit to 7 Polka Dots website because they are selling lots of Rilakkuma related merchandise. This Rilakkuma Sticky Memo is available in 4 colors which is yellow, orange, pink and blue. It is so cute isn’t it? Another Rilakkuma’s product. The quality of this sticker is so good and you can stick it to anywhere for example like phone, glass, paper even though on the wood. The material of this make-up sticker is matte PVC. There are 3 sheets in a set (Eye, Nose & Mouth). You can use your creativity to DIY it. See! I use it to DIY my headphone and iPad cover. I love this the most. Cuteness overload. You can organize your stuff by using this folder. It makes everything easy yet it is cute and pretty. It is available in 2 colors which is brown bear and beige bear. I got mine in brown color. Love it so much.